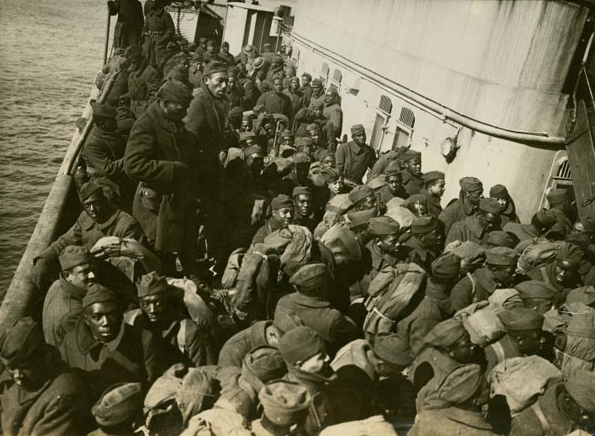 World War I was a transformative moment in African-American history. The war directly impacted all African Americans, male and female, northerner and southerner, soldier and civilian. The war years coincided with the Great Migration, one of the largest internal movements of people in American history. Between 1914 and 1920, roughly 500,000 black southerners packed their bags and headed to the North, fundamentally transforming the social, cultural, and political landscape of cities such as Chicago, New York, Cleveland, Pittsburgh, and Detroit. The Great Migrationreshaped black America and the nation as a whole. Black southerners faced many social, economic, and political challenges that made them want to migrate to the North. The majority of black farmers labored as sharecroppers, remained in debt, and lived in poverty. By the time of the war, most black people had been stripped of their right to vote. Jim Crow segregation, legitimized by the Plessy v. Ferguson (1896) Supreme Court ruling, forced black people to use separate and usually inferior facilities. The southern justice system denied them equal protection under the law and condoned the practice of vigilante mob violence. Photographs and Prints Division, Schomburg Center for Research in Black Culture, The New York Public Library. Wartime opportunities in the urban North gave hope to such individuals. The American industrial economy grew significantly during the war (Duffy). Unable to meet demand with existing European immigrants and white women alone, northern businesses increasingly looked to black southerners to fill the void (Sandman). In turn, the prospect of higher wages and improved working conditions prompted thousands of black southerners to abandon their agricultural lives and start anew in major industrial centers (Williams). Black women remained confined to domestic work, while men for the first time in significant numbers made entryways into the northern manufacturing, packinghouse, and automobile industries (Sandman). African-americans did not always get what they expected the north to be (Williams). They frequently endured residential segregation, substandard living conditions, job discrimination, and in many cases, the hostilities of white residents. But life in the North was nevertheless exciting and liberating. No longer subjected to the indignities of Jim Crow and the constant threat of racial violence, southern migrants experienced a new sense of freedom. Most African Americans nevertheless saw the war as an opportunity to demonstrate their patriotism and their place as equal citizens in the nation. "Colored folks should be patriotic," the Richmond Planet insisted. "Do not let us be chargeable with being disloyal to the flag." Black men and women for the most part approached the war with a sense of civic duty. Over one million African Americans responded to their draft calls, and roughly 370,000 black men were inducted into the army (Williams). The military created two combat divisions for African Americans. One, the 92nd Division, was composed of draftees and officers. The second, the 93rd Division, was made up of mostly National Guard units from New York, Chicago, Washington, D.C., Cleveland, and Massachusetts. The two black combat divisions, the 92nd and 93rd, was made up of approximately 40,000 troops. The army assigned the vast majority of soldiers to service units. Black soldiers were stationed and trained throughout the country, although most facilities were located in the South. They had to endure racial segregation and often received substandard clothing, shelter, and social services (Williams). At the same time, the army presented many black servicemen, particularly those from the rural South, with opportunities unavailable to them as civilians, such as remedial education and basic health care. Military service was also a broadening experience that introduced black men to different people and different parts of the country. World War I brought about tremendous change for African Americans and their place in American society. The Great Migration transformed the demographics of black communities in the North and the South. The war effort allowed black men and women to assert their citizenship, hold the government accountable, and protest racial injustice. Military service brought thousands of black men into the army, exposed them to new lands and new people, and allowed them to fight for their country (Williams). Black people staked claim to democracy as a highly personal yet deeply political ideal and demanded that the nation live up to its potential (Sandman). World War I represents a turning point in African American history, one that shaped the course of the black experience in the twentieth century.